SO, a couple weeks ago the design team for Joy Clair Stamps received a package with two new stamp sets for a project for last month. I made my project and immediately started thinking of another. I used Memento Lady Bug and Danube Blue Inks on this project. The paper is all Recollections, and the bakers twine is from Dollar Tree. I hope you have enjoyed this project. I am submitting it to the Summer Coffee Lovers Blog Hop. Love the distressed look of this card, great interpretation of the summer coffee theme! Oh, this is fun and awesome! LOL Love this FUN & witty card. Oh LeeAnn! I love this card, I was trying to come up with something like that too, but alas I ran out of time! 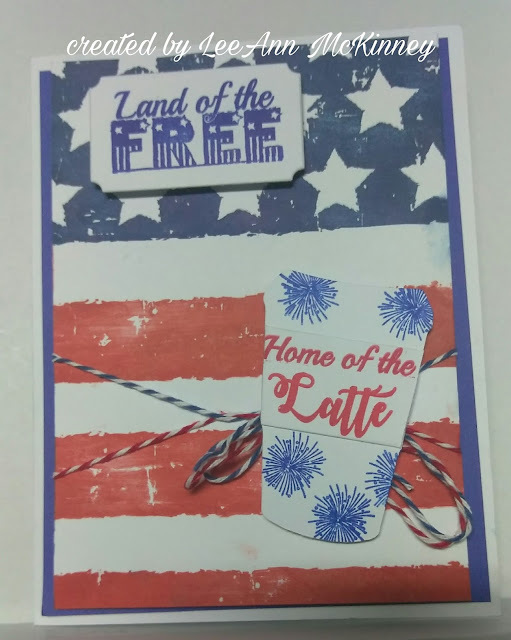 Love your patriotic coffee card! Great Americana look to your design. Perfect for the Fourth!